What is The Teloscope Bot? The Teloscope Block Producer is an initiative by CTIC Centro Tecnológico not-for-profit private foundation, concerned with exploring the real-world applications of newest blockchain technologies. We help corporate, public and not-for-profit sectors to conceptualise blockchain solutions, to implement blockchain infrastructure, to develop smart contracts and distributed apps, and to boost community building. Our code of Conduct and Ownership Disclosure. The Teloscope has its own physical infrastructure dedicated to the production of blocks over TELOS based on bare-metal servers, hosted in TIER III grade datacenters and maintained 24x7 by the staff of The Teloscope. 2 physically independent 1Gbps Internet data accesses. Double perimeter firewalls for access restriction and protection against DDoS attacks. Additional local firewall in each of the nodes. Smart Proxy for advanced load balancing ( automatic retries, circuit breaking, global rate limiting, request shadowing, local zone load balancing, etc.) between the Block Producing Node and the Full Node that act as redundancy. Complies Level 5 of Telos suggested architecture: 2 x Full Node + 1 Block Producer + 1 Seed Node + 1 x Backup. Security system: video-surveillance, access control, security guards, etc. Uninterrupted Power Supply (UPS) systems and backup generator. Remote hands for fast deployment or replacement of hardware. The 24x7 monitoring of hardware and processes allows planning the need for hardware scaling sufficiently in advance. N + 1 redundancy allows disconnecting one of the nodes for expansion or even complete replacement (scale up), without interrupting the service to the TELOS community. By repeating this process, the processing capacity of the block producer can be easily scaled without service interruption. The Teloscope works continuously to improve the service it provides to the TELOS community. This includes testing new solutions and performance improvements related to block production nodes. These tests are performed on an environment fully independent of the production infrastructure, running on servers owned by The Teloscope. Using an advanced proxy allows diverting a replica of the actual traffic to the pre-production environment without affecting the BP, making The Teloscope able to test at any time a potential improvement with real data in an environment physically independent of the productive one. This web application sumarizes several live informations about the Telos Blockchain network. Although raw data is public, giving it a meaninful sense can be difficult for non technical users. It can even be tedious for people using a block explorer. Unlike a block explorer, Chainspector offers a set of tools that present useful information so the user can play with it. On its very first version, the application offers four sets of tools. But with your feedback we expect to add many more. Future development of chainspector will align with what the community needs. You can shape our development! In Medium you can read an introductory article about Chainspector. The Teloscope Bot is a third-party application that runs inside the messaging app Telegram. Users can interact with The Teloscope Bot by sending messages and commands to it by opening a chat with it. 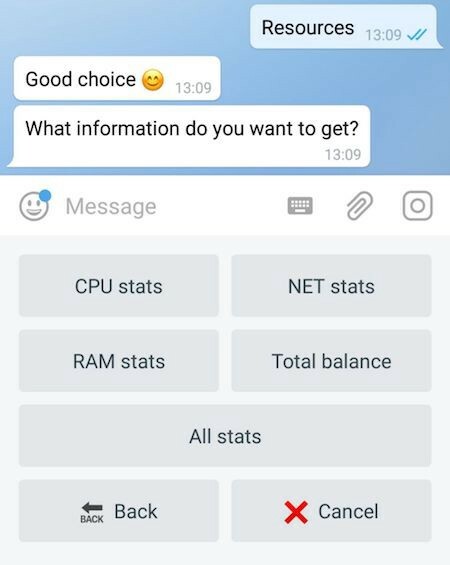 Get information about Telos accounts: display stats about CPU, NET, and RAM resources, total balance, votes cast and inclusion in snapshots. Monitor accounts and premium names: subscribe to real-time notifications and set a threshold to filter out irrelevant Tx. Check TLOS exchange rate in EOS and US dollar, or use the TLOS to USD converter. Create a new Telos account for free. You can read the Teloscope Bot guide on Medium. You can access The Teloscope Bot at https://t.me/TeloscopeBot. This is a demo application of Sensor DApp. The chart displays sensor data uploaded to the Telos Blockchain from a light app running on a Raspberry Pi equipped with some external sensors. You can adjust some parameters to choose different sensor data or time scale. Goals: Faithful monitoring of parameters (temperature, humidity ...) for logistics or other areas. Solution: Real-time sensor registration application in blockchain. Beneficiaries: Agrifood, pharmaceutical traceability, etc. You can read the DApp development tutorial on Medium. Registration and control of data related with the lifecycle of vehicles. In this project we have developed an application, CarTrustChain, which store relevant information about the story of a vehicle in an Ethereum public blockchain. An example of the information secured in a blockchain for each vehicle is the odometer reading at each time during its servicing/maintenance cycle. The aim is not only prevent the odometer fraud but also improve the air quality of cities. Registering more valuable information of a vehicle, apart from its mileage, such as its correct maintenance, will also benefit the air quality of cities. Because a faulty engine, may be caused by skipping or not properly servicing the vehicle as recommended by its maker, could cause pollution and damage the catalyser. IoT implementations for the automated maintenance of machinery. In this project we have developed a system based in a blockchain that registers most usual incidences that can happen to an elevator, such as broken cabin light, elevator overload, doors not closing, etc., as well as maintenance and repair activities. This way all stakeholders (manufacturers, maintenance companies, building tenants, control authorities) will share relevant information in a secure and trustworthy way, avoiding service conflicts (guarantee, insurance…) and better complying with security regulations. In this project we have developed a blockchain-based ticketing platform for the management of e-tickets that ensures security and flexibility while minimising the possibility of counterfeit tickets. The whole ticket journey can be tracked by promoters from purchase to entry. Tickets are verified simply by scanning the QR code that contains the ownership information. Once the show ends artist and promoter are automatically paid based on how many total tickets were sold and the agreed profit-sharing rules.